We will be attending AAA 2018! Contact [email protected] for pricing and specifications. Great turnout at EMS Today! Thank you to everyone who stopped by our booth at EMS Today. It was a great show! Crossover Ambulance on the Ram ProMaster. Thanks to FCA for allowing us to share this video of our Crossover Ambulance on the Ram ProMaster. This video was filmed at FDIC 2017. Come see us in Booth 2020! Malley Industries manufactured two new Ford Transit ambulances for Bermuda. Click here to read the article. We will be attending AAA 2017! We will be attending EMS Today with a Malley Crossover Ambulance from February 23-25. Come visit us at booth 539! Thanks to Valley Ambulance Services for allowing us to display their new vehicle. There’s nothing quite like having the opportunity to do a direct comparison when it comes to ambulances. On the left, traditional cabinetry construction on the now discontinued Ford E:Series chassis. 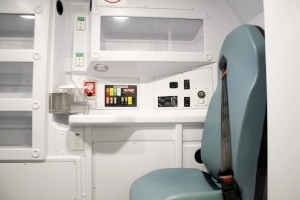 Beside it is a spacious Ford Transit Malley ambulance with its innovative space-enhancing interior. On the right is Malley’s multiple-award winning Crossover Ambulance conversion on the front wheel drive Ram ProMaster. We are honoured to have received a 2016 Top EMS Innovation Award for our Crossover Ambulance from EMS World Expo, the largest EMS show in North America. We will have a Malley Crossover and our new Ford Transit ambulance on display at the 2016 AAA Annual Conference & Trade Show next month.